It was another luncheon outing of the “lovely library ladies”, the group of us from the book club who meet once a month for lunch at various eateries in Portland. 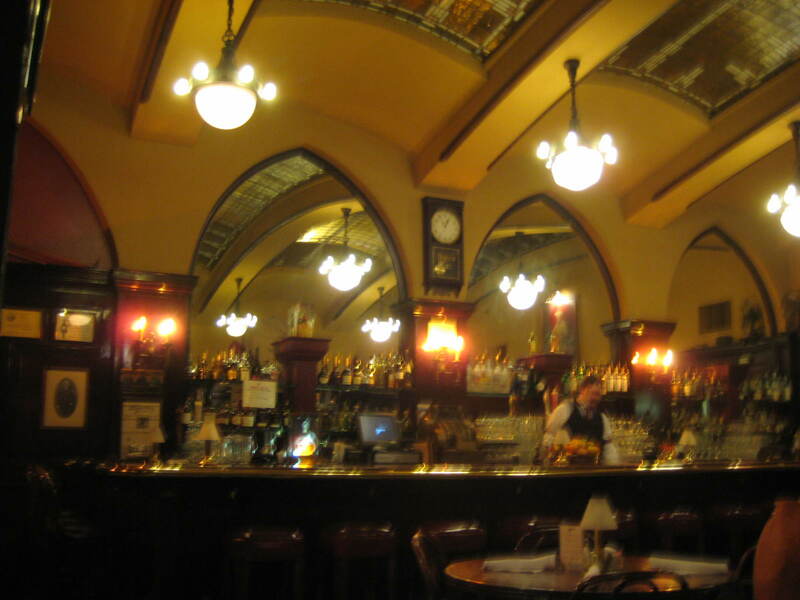 This time we decided to try Huber’s Cafe, the restaurant that sports this claim to fame, “Established in 1879, Huber’s is Portland’s oldest restaurant”. It is a beautifully old, dark wood, lowly lit place from a time past. The room we ate lunch in is covered by a ceiling of Tiffany glass, along with a bar that looks like it came out of an old Hollywood movie, complete with the original brass cash register. Huber’s was started by Frank Huber, but was eventually taken over and bought by Jim Louie, a Chinese immigrant hired by Frank Huber as Huber’s original cook. The main menu item of the early Huber’s was a turkey sandwich and coleslaw, and Jim Louie continued on with the turkey tradition, expanding the menu to include many different types of turkey offerings. The turkey melt sandwich I had with brie cheese and caramelized onions on a toasted baguette was very tasty, along with Huber’s famous coleslaw that lived up to its reputation as delicious. But the best part, and certainly most entertaining was the Spanish coffee we had after our meal. 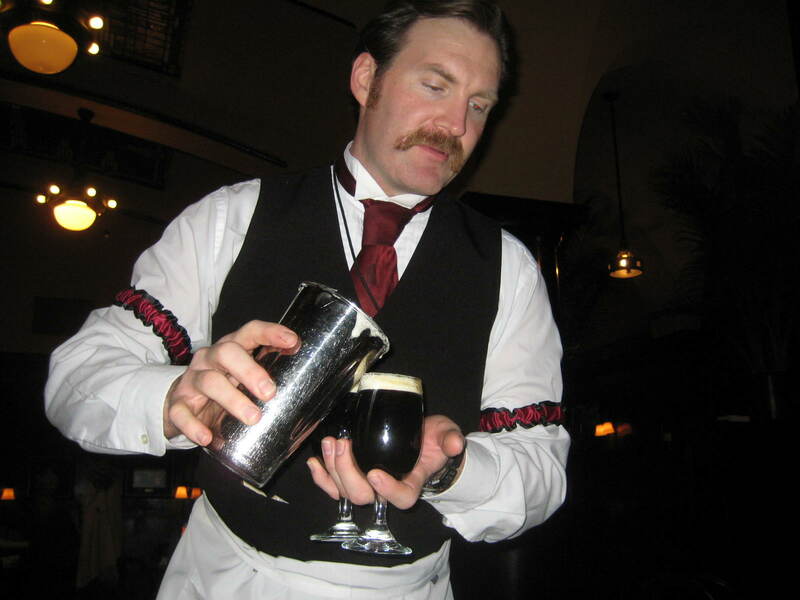 This drink was developed by James Louie, another member of the Louie family, and having it prepared table side is an event in itself. This amazing and very yummy drink consists of Kahlua, 151 proof Bacardi rum, Bols triple sec and hot coffee, topped with fresh whipped cream and nutmeg – what a tantalizing combination of flavors it is! 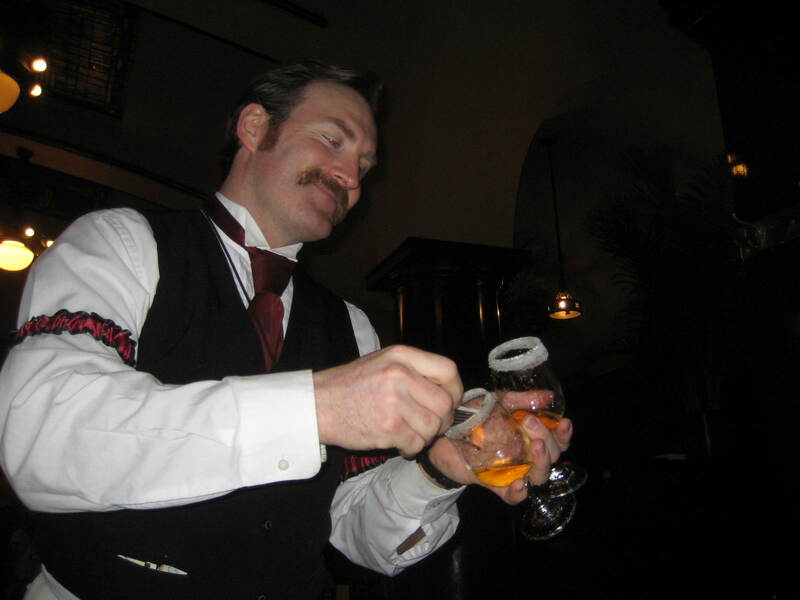 The bartender came to our table with a tray of all the needed ingredients and special heat resistant glasses rimmed in sugar, and proceeded to concoct our beverages with the showmanship of a magician. 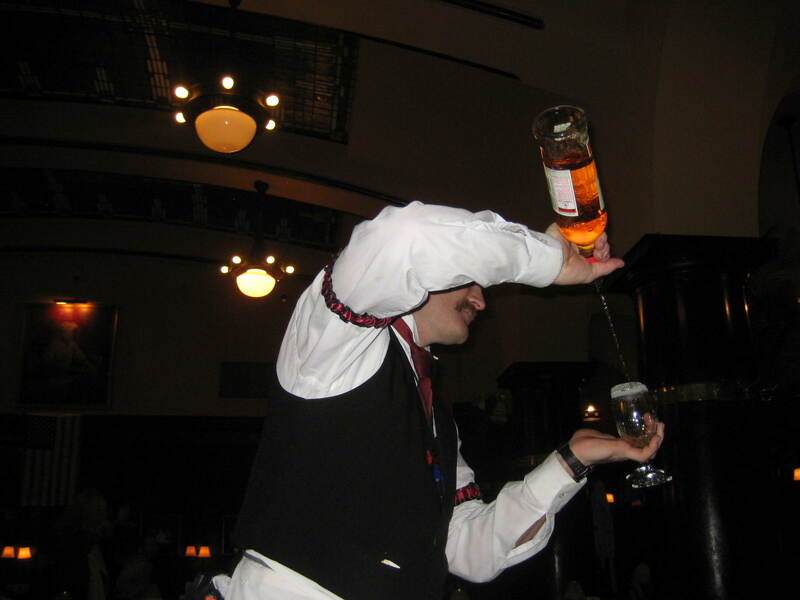 He poured layers of the various liquors into the two glasses he held, as he moved his arms in an sweeping arc, almost like the movements of a ballet dancer. And at one point in this performance, he lit the liquid inside the glasses on fire, adding much flair to the whole spectacle. It was the perfect end to a delightful lunch on a cold and rainy Portland day, as we added another great Portland food destination to our ever growing list of lunch time adventures had by the lovely library ladies.